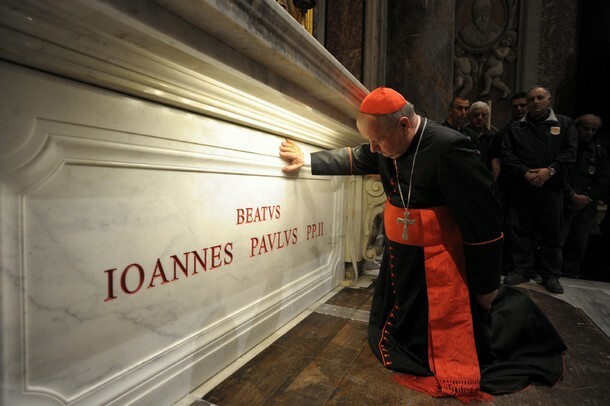 Last night, after a public veneration of his casket that drew hundreds of thousands into the Vatican basilica over two days, the body of Blessed John Paul II was re-interred in its new spot on the main floor of St Peter's. The marble sarcophagus placed under the altar in the side-chapel dedicated to St Sebastian, the first Eucharist over the late Pope's remains was celebrated this morning by his closest aide of four decades, now his successor as archbishop of Krakow, Cardinal Stanislaw Dziwisz (above). Given the popular custom for both resident and visiting priests in Rome to celebrate early morning Masses at the niche altars of the world's largest church, suffice it to say, there's a new most-popular spot for that now. How the demand will be balanced with the throngs of faithful who come to pray and pass by, though, remains to be seen.